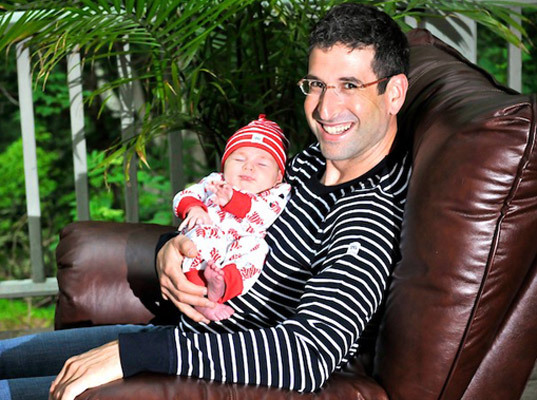 Josh Dorfman, the Lazy Environmentalist, Named Dad of the Year! Congratulations to one of our favorite green dads, Josh Dorfman (better known as the Lazy Environmentalist), who was just named Dad of the Year by Polarn O. Pyret, one of our favorite green clothing labels. Dorfman wears many hats: He’s the owner of Vivavi, a sustainable furniture store; the author of two books; the host of his eponymous radio show; and the executive producer and star of The Lazy Environmentalist on the Sundance Channel. With the birth of his son, Shepherd Greyhawk, Dorfman can also add “father”—his biggest role yet—to his extensive resume. So it shouldn’t surprise anyone that two-month-old Shep is one of the greenest babies on the block. Dorfman and his wife, Squeen, have stocked up on organic cotton clothes, cloth diapers, and homemade reusable baby wipes. Has newfound fatherhood made Dorfman even “lazier”? “When people have children, I believe it becomes easier to kick the bad habits and make greener choices because you’re no longer making those choices just for you. You’re now making them for your children,” Dorfman says. His advice? Spend more on quality clothing and you’ll pay less in the long run, especially if you can hand those clothes down to a sibling, cousin, or neighbor. “Less clothing in landfills is better for the environment. It’s an easy choice to make,” Dorfman says. Congratulations to one of our favorite green dads, Josh Dorfman (better known as the Lazy Environmentalist), who was just named Dad of the Year by Polarn O. Pyret, one of our favorite green clothing labels. Dorfman wears many hats: He's the owner of Vivavi, a sustainable furniture store; the author of two books; the host of his eponymous radio show; and the executive producer and star of The Lazy Environmentalist on the Sundance Channel. With the birth of his son, Shepherd Greyhawk, Dorfman can also add "father"�his biggest role yet�to his extensive resume.